This is the easiest preschool storytime I have even put together! The books are all fabulous and the kids loved the program. This storytime incorporated science, math, and early literacy skills, with the art of story supported by beautiful illustrations. As families arrived, kids picked out one of our new sit mats for themselves and then joined me for singing and movement guided by our Rhyme Cube. 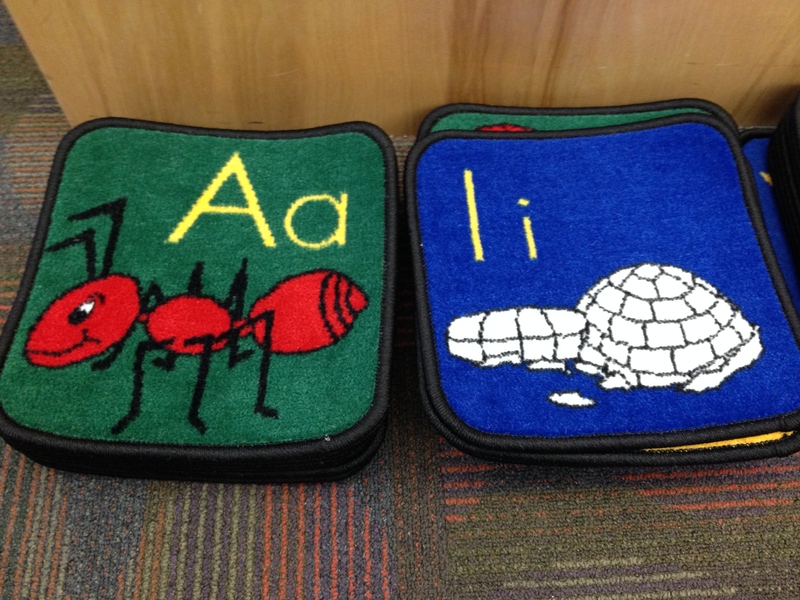 I love these new mats which were paid for with an early literacy grant from the Alaska State Library! 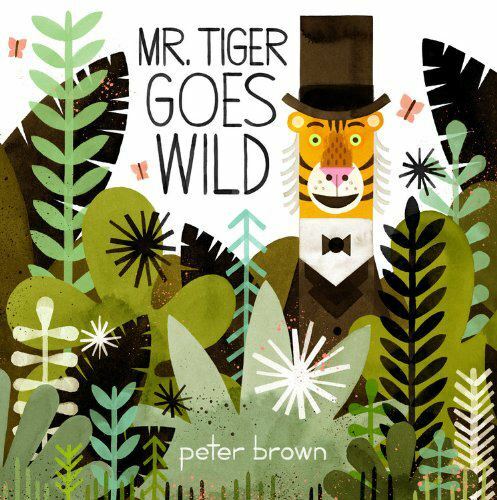 I used this non-fiction title to introduce the storytime theme, Tigers. 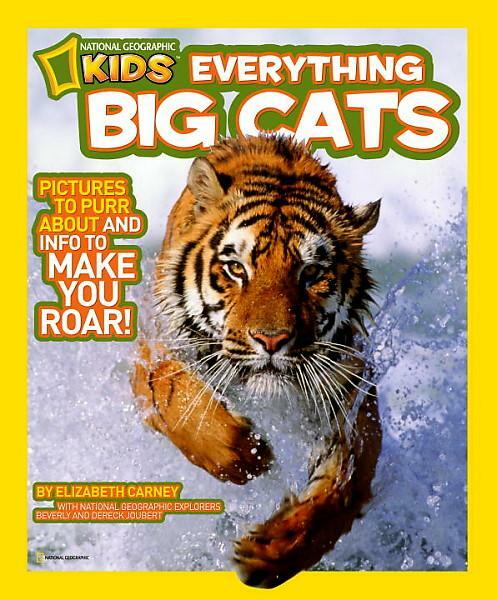 We spent several minutes looking at high quality photographs of tigers and talking about what a tiger looks like, what distinguishes a tiger from other big cats like lions, where tigers live, and what they eat. The sign language version of this song was modified from Marge Loch-Wouters‘ crocodile version of the Five Little Monkeys song. When I sing the second verse with the penny whistle, I play down the scale when I ask them to sit down and play up the scale to have them stand back up. The kids quickly associate the change in sound with the appropriate action. Down in the jungle with the beat in your feet, Think of an animal that you’d like to meet. That you’d like to meet! A tiger, A tiger , I want to see a tiger! ROAR! 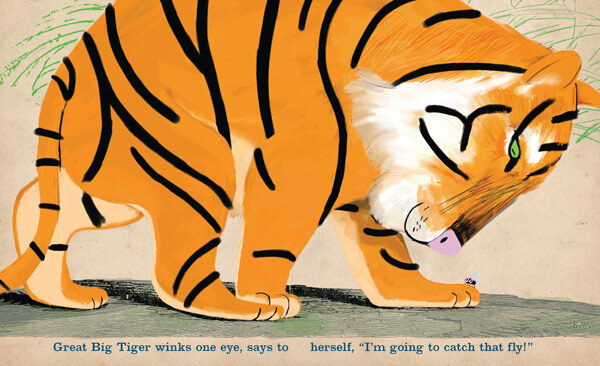 Rosen’s gift for writing picture books is demonstrated, yet again, in this story about a sly little fly that is able to escape the swatting of a tiger, the rolling mass of a hippo, and the tramping of an elephant. This is a fun story to read aloud because of the sound words, repeated text, and accompanying illustrations. Along with the other books I read today, Tiny Little Fly‘s artwork is noteworthy. Waldron’s illustrations are sophisticated but child friendly. The nature-inspired hues on an off-white background provide a good context for the story. 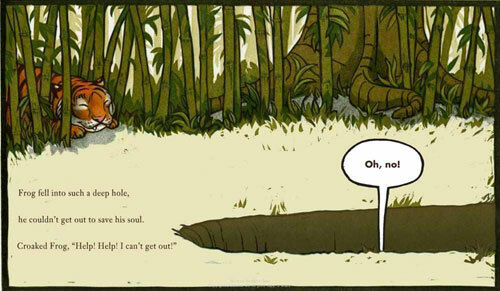 Waldron adds to Rosen’s story with the placement of the animals throughout the book. The book design includes a partial view of each animal as the story progresses which invites kids to interact by guessing what animal comes next in the sequence. Tigers provide a subtle way to talk about patterns which was the focus of the craft/activity portion of this storytime. Drawing attention to something as simple as the orange and black pattern of a tiger helps kids recognize patterns, important for both language and math literacy. 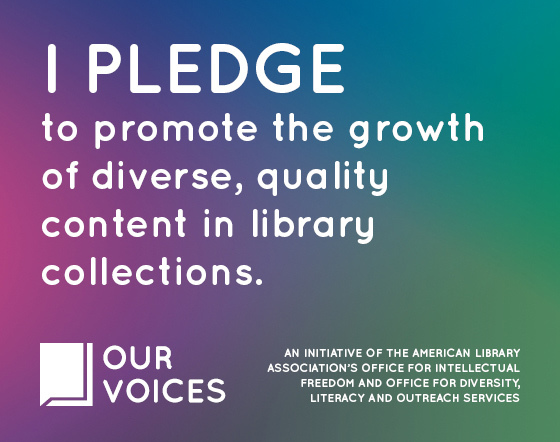 Storytime and the following activity, both take place in our children’s library. Before each storytime, I set up the large table seen here with all of the materials kids and their caregivers will need for the activity. This week, I put small signs and labels by the needed materials to make it easy to choose the materials for the two activities I provided today. The signs also demonstrate to parents one way to create a text-rich environment for their kids. Creating a tiger mask was the first activity. Before this week’s storytime, I cut out the center of each of the paper plates and hot glued the plates on to wooden craft sticks. I also prepped some of the materials they used to decorate the masks, as noted below. Today kids used the supplies to assemble the mask. The second activity was a simple pattern project. 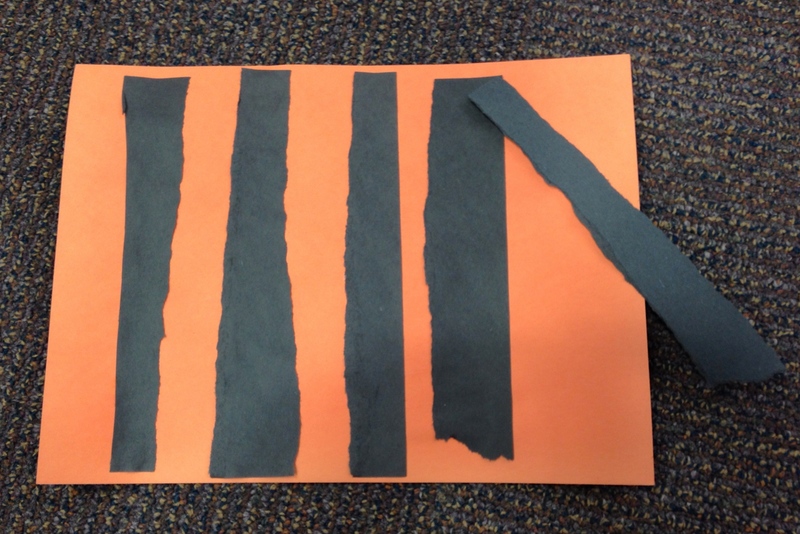 Kids, particularly the younger ones, ripped strips of black paper and glued them on the orange paper to create a pattern.